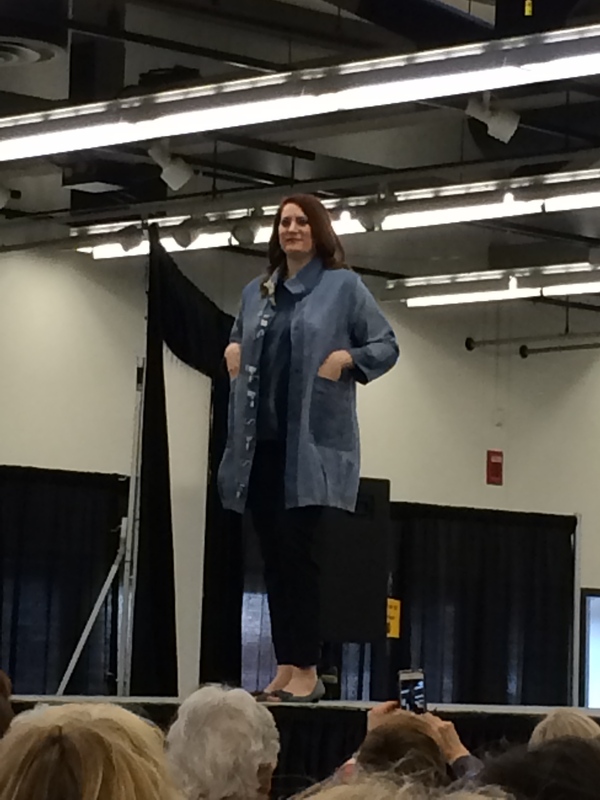 The fashions are great at the Puyallup Sewing Expo 2014 and best of all, there isn’t any snow!! 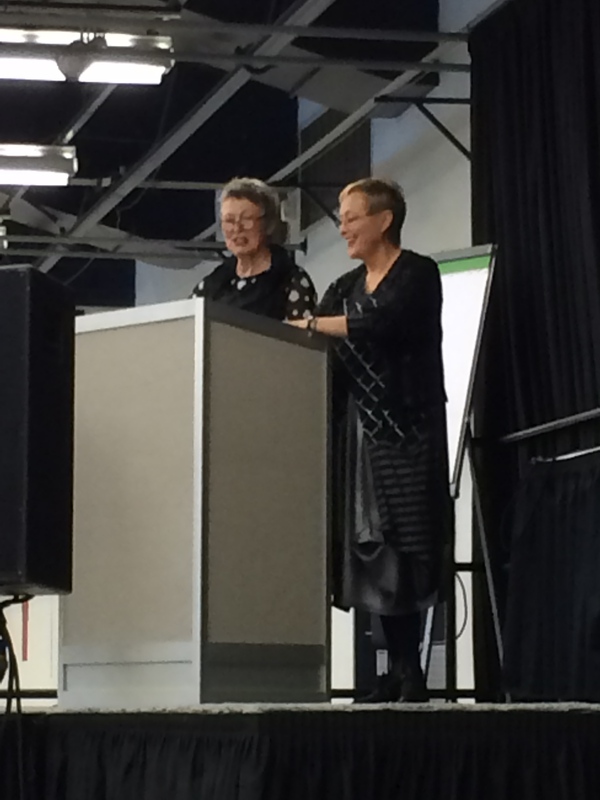 Joining a “Sew Many Options Tour” with Marsha McClintock for the sewing expo has turned out to be a good decision. Lee, from the Saturday Fashion Sewing Club, did this last year and recommended it. 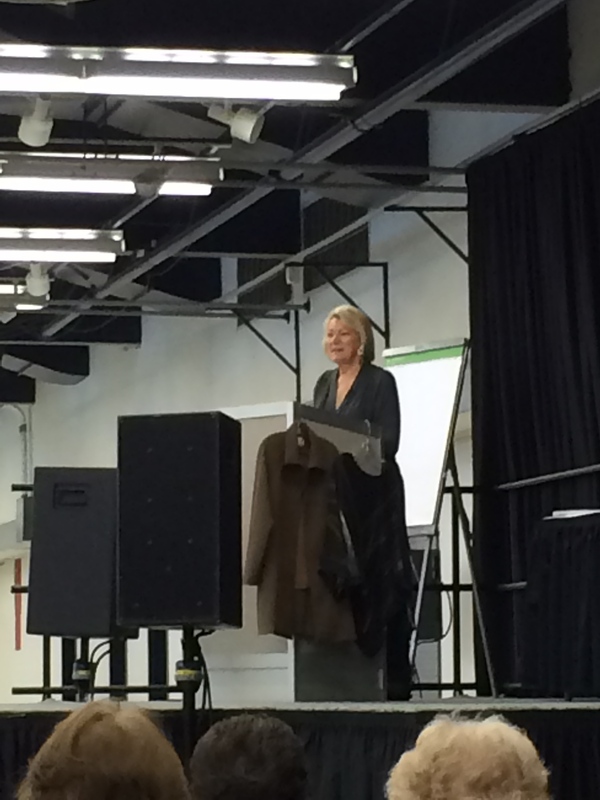 My day started with a two hour bus trip from Portland and a winning ticket for one of the door prizes on the way. 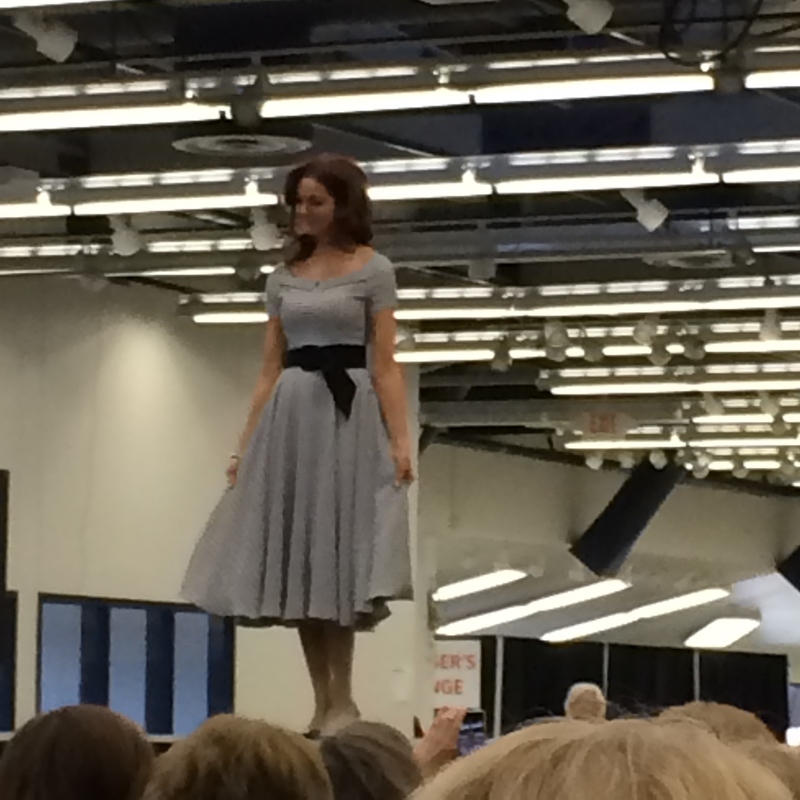 Now if only my luck would hold out for one of those new sewing machines being given out at the expo……. 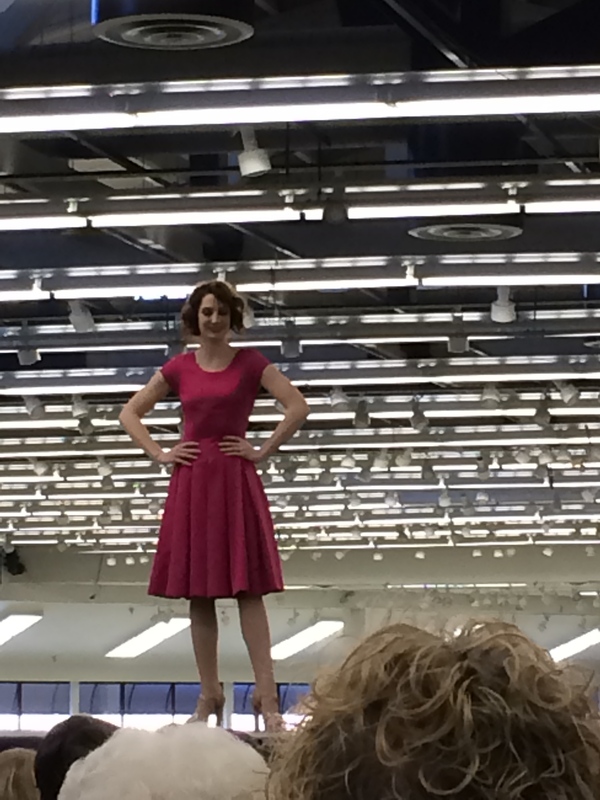 Classes, fashion shows and shopping filled the day. 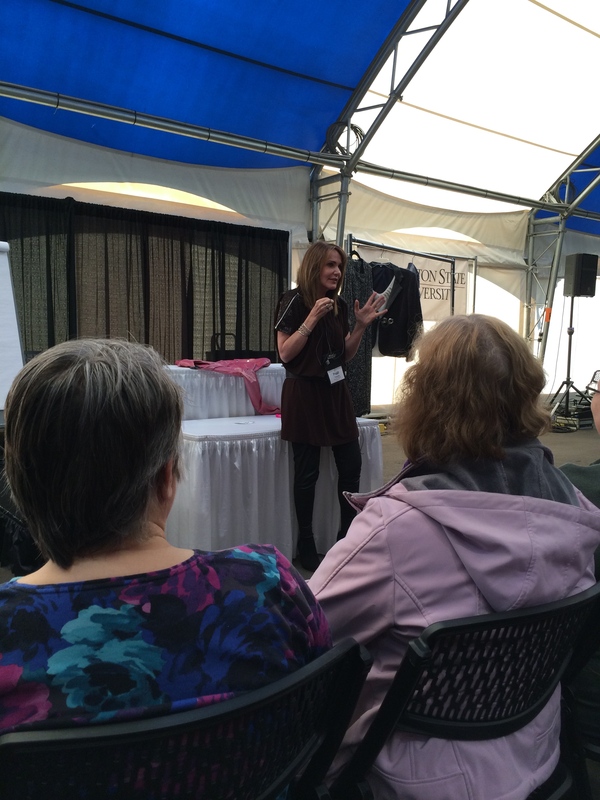 A leather sewing class by Peggy Sagers was filled with new information including that you can wash leather in the washing machine. Who knew? The first fashion show I attended was narrated by Patti Palmer of Palmer/Pletsch fame and featured patterns from McCalls, Butterick and Vogue. Lots of dresses which seemed to fall into two major categories: form fitting sheaths or twirly full skirted dresses. Most were sleeveless which is not always the most flattering for those of us of a certain age. Trends were described as including either brightly colored solids or water colored or splashy prints. Dresses with interesting details were also featured. Check out these pictures and see what you think. 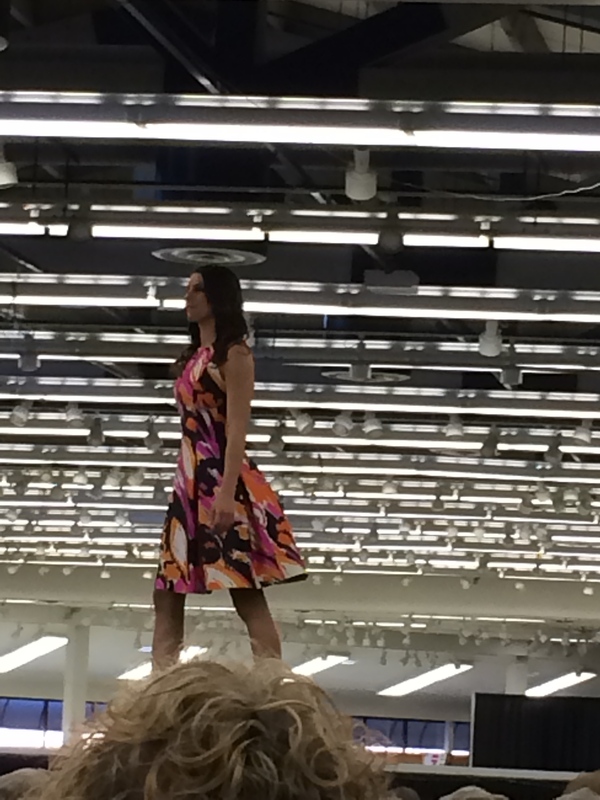 Also, the fashion show by Marcy and Katherine Tilton was delightful. Their choices are always interesting and include styles we can all wear while still including some edgy items only for the brave. See a few pictures from their show. I did find a few pieces of fabric while shopping at their booth. Also, if any of you follow the blog “Communing with Fabric”, its author, Shams, was shopping while I was there and we picked two of the same fabrics. She has good taste! I found some things at Linda Lee’s booth as well as a new pattern from Louise Cutting. Diane Erickson has some beautiful new upcycled items that are fun to see. She is so creative and is using Tee Juice markers to draw and embellish items. I had to buy some to try. All for now as I have to rest up for tomorrow. They are predicting some snow, just can’t seem to get away from it. 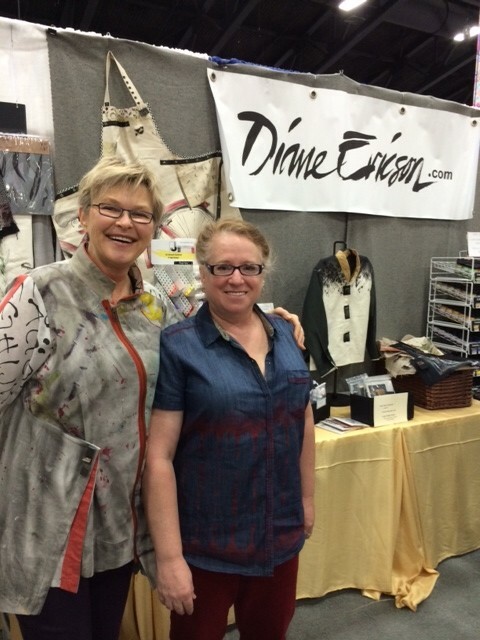 Posted on March 1, 2014 by KristinPosted in Events, Garment pictures, Places to go, Sewing and Quilting ExpoTagged Butterick, Communing With Fabric, Diane Ericson, Katherine Tilton, Linda Lee, Louise Cutting, Marcy Tilton, McCall's, Peggy Sagers, Puyallup Sewing Expo, Vogue. Next Next post: Back in Portland after the second day at Puyallup 2014 and still no snow!!! Kay, I’m so jealous. I sew want to go again. When I first arrived my brain was in TOTAL overload – I didn’t know where to look first. I’d never seen anything like it at any of the expos I had previous attended. Thanks for taking the time to post after what I know can be an exhausting (in a good way) day. In the afternoon look for the truck outside with the warm raspberry scones – to die for! Perfect afternoon break!